THE EUROPEAN COURT of Justice has ruled that the UK can unilaterally revoke Article 50, halting its withdrawal from the EU. “The United Kingdom is free to revoke unilaterally the notification of its intention to withdraw from the EU,” the court said, in response to a suit from a group of Scottish politicians. 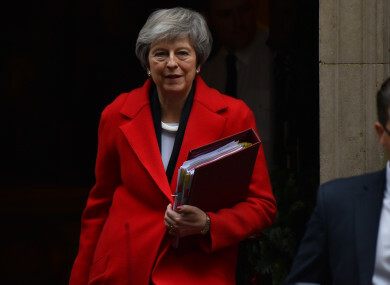 British Prime Minister Theresa May insists she has no plans to reverse Brexit, despite parliamentary opposition to her withdrawal deal from both pro- and anti-Europe MPs. Under Article 50 of the Lisbon EU treaty, any member state can declare its intention to quit the union, a decision which for Britain comes into effect on 29 March next year. Britain invoked the article on 29 March 2017 – after voters backed Brexit in a national referendum the year before. A group of Scottish legislators had asked the ECJ to rule on whether the UK could pull out of the withdrawal procedure on its own. This morning, the ECJ ruled that “when a member state has notified the European Council of its intention to withdraw from the European Union, as the UK has done, that Member state is free to revoke unilaterally that notification”. The possibility of revoking Article 50 exists as long as a withdrawal agreement concluded between the UK and the EU has not entered into force or if no such agreement has been concluded, during the two-year period. The ECJ said it would be inconsistent with the EU Treaties’ purpose of “creating an ever closer union among the peoples of Europe to force the withdrawal of a Member State,” after that state has notified its intention to withdraw and following a democratic process decides to revoke its notification to withdraw. The news was welcomed by the six Scottish politicians who took the case, MEPs Catherine Stihler, David Martin, Alyn Smith, MSPs Ross Greer and Andy Wightman, and MP Joanna Cherry. Smith, who described the ruling as “dynamite”, said that while bringing the case was a risk, the outcome was better than the group could have hoped for. “The timing is sublime,” he said in a statement. However, the British government insists it has no intention to revoke Article 50, despite the court ruling. “We don’t want to stay in the EU,” Environment Secretary Michael Gove, an influential Brexiteer, told BBC Radio 4. “We voted very clearly. This case is all very well but it doesn’t alter either the result of the referendum or the clear intention of the government to leave. With reporting from AFP and Stephen McDermott. Email “EU's top court rules that UK could reverse Brexit process”. Feedback on “EU's top court rules that UK could reverse Brexit process”.